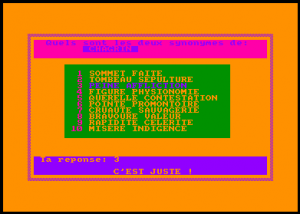 Vocabulaire Alain Cornu, Philippe Schweitzer (France), Cobra Soft (France), 1986 Download it Now ! Vocabulaire is an Edugame. It leads gamers to chose definitions and to find letters combinations, in order to improve their french vocabulary. Its aim is educational. The Primary school pupils are mainly concerned.